When a tragedy, senseless and cruel, snatches a life too young, its damage can go far beyond the victim. • When Ronald Pressley Jr. shot and killed Albert Perry 20 years ago in Tampa's Ponce de Leon Homes — seemingly because Albert, 19, a former Leto High football star, shot 25-year-old Ronald's car with a water gun at a block party — four unwitting people stood at life's crossroads. • The death sought to snuff out the amicable relationship Cheryl McCarter, Albert's mother, shared with Ronald's father, Ronald Pressley Sr. • It tried to decimate the mentoring desires of former NFL player Tyrone Keys. • It could have jaded car dealer Jerry Ulm and shattered the dreams of 12-year-old Ricky Sailor. • How each emerged from that intersection of pain and devastation remains both a remarkable and improbable story. Although police and media reports told the tale of the water gun dispute, bad feelings brewed between Ronald Pressley Jr. and Albert Perry long before the night they clashed for the final time. But Ronald Pressley Sr. never imagined it would escalate into a violent death. "I thought I had defused the rhetoric going on between them," Pressley said. Pressley's son and namesake, Ronald, resided in a Polk County work-release program, serving time for a drug conviction. He walked away from the program once and came to Tampa, but his father insisted he return — and implored him to shelve his differences with Albert. A barber, Pressley told Albert the same later on when he cut his hair. But Ronald left the work-release program again, and this time he didn't tell his father. He argued with Albert at the block party. After the shooting, a group of Albert's friends found the younger Pressley at a friend's home in West Tampa and pistol-whipped him. Today, Ronald Pressley Sr. speaks only of regrets. "I raised my son to be a good person," he says wistfully. "All you can do is try to raise them the right way. They're going to make their own decisions." At the trial for Pressley's son, prosecutors brought forth five witnesses who all insisted Ronald shot Albert three times in the back as he tried to run away. A jury convicted Ronald of second-degree murder and he was sentenced to 40 years in prison. To this day, Ronald Pressley Sr. and Albert's mother, Cheryl McCarter, maintain a decades-long friendship. At one time, Pressley held the title of "the barber" for kids and adults in West Tampa's housing projects. Largely using his clippers as a side business, he says he gave many of the area children their first haircut. He often cut young Albert's hair. Today, the Vietnam veteran spends his retirement fishing on his boat, but he still cuts. And as he has for years, he trims McCarter's short Afro. "I have a lot of respect for how she handled an unfortunate situation," said Pressley, 65. "Some people couldn't understand how she could handle it this way, but I can't change what happened. She can't change what happened. "We just had to pick up the pieces and deal with it." McCarter and Pressley are an example of the sense of closeness represented by the neighborhood in years gone by. Everybody knew everybody. Pressley grew up with McCarter's aunts and uncles. She says she loves "Mr. P.," a man who always tried to give back. "We've always talked," said McCarter, 55. "No matter what, I've stayed in contact with him. I still speak to him because he's 'Mr. P.' "
Just four days before the April 25, 1993, shooting, former NFL player Tyrone Keys ran into Albert at a midnight basketball game in North Boulevard Homes. The football player didn't expect to see Albert, whom he believed had left for Texas Southern University a year earlier on a scholarship. But Albert said he didn't have the money to make the trip to Texas. He had spent the last year in Tampa, getting in trouble with the law and desperate to escape the ravages of his neighborhood. He told Keys if he didn't get out he would end up dead. Four days later Albert died, and Keys grew more determined to help kids graduate from college. Keys turned to Jerry Ulm, a man who owned a Dodge dealership on Dale Mabry Highway, not far from where Keys once played football, first with the visiting Chicago Bears and then for the Tampa Bay Buccaneers. He told Ulm Albert's story and how he needed someone to lend a hand for the kids he sought to help. Ulm wrote a check and agreed to hire two of Keys' young proteges — Eric Hayes and T.J. Lewis — to wash cars at the dealership. "Dealerships get a lot of requests," said Ulm's son, Scott, a sales consultant for the company that still bears his father's name. "For (Tyrone) not to have anything established, (my dad) must have seen something." Today, Hayes is the basketball coach at Jefferson High and Lewis is a former Bank of America executive who now operates his own investment firm. Ulm would never know the impact of his blind faith. Three months after meeting Keys, he died at 61. The family asked friends to make donations to a new nonprofit, Keys' All Sports Community Service. Even at 12, Ricky Sailor knew about Albert Perry. Not too many great athletes came out of West Tampa housing projects, but Albert was one. At Leto, he made a name for himself as one of the county's top running backs, including a school-record 334 yards. When Sailor emerged from that same neighborhood to become a star football player at Leto, his coach gave him a gift: the jersey with Albert's No. 23. As fate would have it, Keys would end up helping Sailor extend his football career, first at Butte College in California and then at Texas Tech. Sailor knew the rules: Everyone Keys helped had to return and speak to younger kids and volunteer at places like the Boys & Girls Clubs. The mantra was come back and give back. Sailor not only fulfilled the promise, but he returned and started Unsigned Preps, a nonprofit that extends the mission Keys initiated in the wake of Albert's death. Oh, and he also gave Keys the jersey that Albert once wore. Today, Keys operates All Sports out of Blake High School in what he calls the "Mentor Legacy Center." Working with All Sports students and members of Blake's Urban Teaching Academy, he routinely takes kids to nearby Just Elementary to inspire the next generation of students. In the center hang all kinds of mementos and photos that reflect his success. Keys has helped more than 2,000 kids go to college, received praise from People magazine, visited the White House and been inducted into the state sports hall of fame in his native Mississippi. 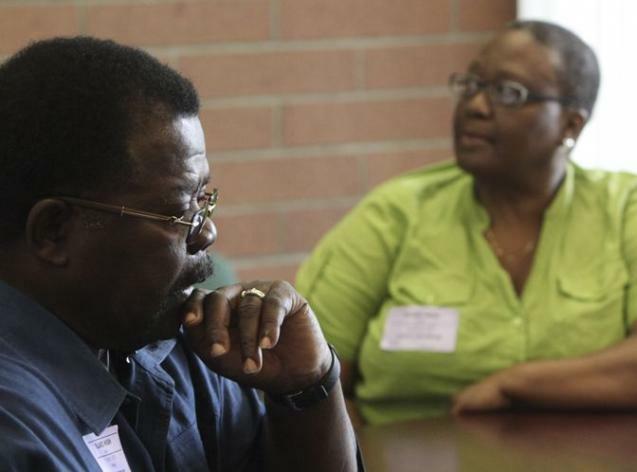 Cheryl McCarter and Ronald Pressley Sr. had never come to the center, never read the articles, never fully understood the impact of all Keys' efforts yielded in the wake of Albert's death. They had never seen the white jersey, neatly framed, hanging on the center's wall. But as the 20th anniversary of Albert's death approached, Keys invited both to pay a visit last week. McCarter and Pressley arrived together.